Text by Frauke Tillmans, Ph.D.
diving is a well-fitted drysuit with appropriate undergarments. Your suit’s material, waterproof zippers, neck seals and wrist seals keep you dry throughout your dive. Staying dry and layering with proper undergarments — along with the layer of air between the suit and your body — provide warmth. Divers can add air using a manually triggered valve, usually situated near the chest, or vent it from an exhaust valve, usually situated at the left shoulder or left sleeve. Well-maintained drysuits hold air, and controlling the flow of air into and out of your drysuit allows divers to both adjust the level of thermal protection and use their drysuit as a buoyancy control device (BCD). 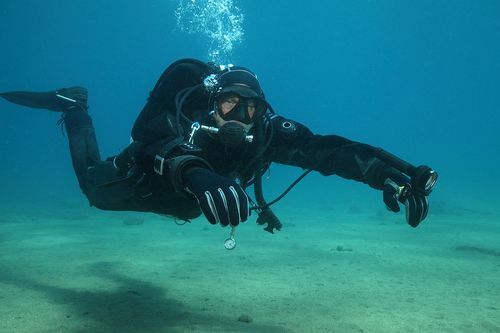 If being in a drysuit in cold water isn’t your natural habitat, consider these five lessons to prepare yourself for this interesting and challenging way to dive. Your gear should not limit your adventures underwater. Diving dry requires more work than diving with other types of exposure suits, and being able to comfortably solve problems while in your drysuit is a must. When you first start diving dry, begin in daylight at a dive site you know well, with an easy entry and adequate visibility, and ideally with an experienced cold-water diver. If you do not see more than the bottom of a pool or a training platform at 15 feet on your first few drysuit dives, don’t get discouraged — extra time might be exactly what you need to make friends with your new drysuit or gear configuration. LESSON 2: PREPARE YOUR GEAR. There are good reasons to aim for redundancy, especially in cold water. Many people diving dry choose to dive with two cylinders or carry a bailout bottle. It’s a good idea to attach your primary secondstage regulator and your primary BCD to two different first-stage regulators if diving with more than one worldwide, and there is no de facto right or wrong approach. I prefer to rely mainly on my drysuit for buoyancy, so I handle only one device throughout the dive. My BCD functions merely as a backup. The key to using a drysuit as the main BCD is proper weighting. If you are underweighted, you will have difficulty getting underwater, but if you manage to get down, you will not be able to add air to the suit, causing uncomfortable squeezes or loss of insulation. If you are overweighted, you will have to add more air to your suit. Air within the suit will always travel toward the surface, and depending on your position, this air could easily make its way to the bottom of your suit around your legs and feet. This could decrease your mobility, make stabilizing yourself in the water column more difficult or even flip you upside down. Proper training will cover how to troubleshoot this situation and properly vent the excess air. LESSON 3: BE PREPARED FOR UNCOMFORTABLE SCENARIOS. common sense. One of the best ways to prevent panic is to think through your responses to a list of potential problems before your dives. Losing or flooding your mask is annoying enough in warm water, but your body will react more adversely to a flush of cold water. to cold hands or loss of dexterity. Practice removing your gloves so you know you can easily remove them, and make sure your buddy knows your gear well enough to help get you out of trouble. Anything from an incorrectly folded seal to catastrophic damage to the suit can cause a leak. While cold water entering your suit is uncomfortable, it is not life-threatening by itself. Excess water in your suit will not drag you down, and depending on your positioning and the severity of the leak, you might even be able to finish the dive with the suit as your main BCD. If the leak is caused by a damaged zipper, a front zip might be more advantageous than a back zip because you can still retain air in the bubble on your back. If the amount of water in your suit or the temperature becomes too uncomfortable to bear, abort the dive in a controlled way; there is no need to make a rapid emergency ascent or omit a safety stop. In cold water the first stages of regulators are more likely to freeze. When they do, this can either prevent air delivery or lead to a free flow. Both situations are uncomfortable but can be handled if you remain calm and do not panic. If you cannot easily draw air from a regulator, make sure you can easily access your alternate air source and breathe from it. In case of a free flow, make sure you are able to turn off the corresponding tank valve. Once you manage the situation, safely abort the dive. LESSON 4: PRACTICE DRYSUIT SKILLS. Know how to properly vent your drysuit. Drysuits can hold much more air than a BCD, and all drysuit divers who use their suits as a BCD should be aware that this air can shift to any part of the suit depending on your body’s position. The exhaust valve is usually located near the shoulder or arms, so this valve, and therefore the upper part of the body, needs to be the highest point to effectively vent air out of the suit. Changing body position throughout a dive is sometimes necessary, but avoid feet-up diving to prevent an inverse ascent. If air shifts to the feet of your suit and flips you upside down, it is critical to be able to get your feet back under your body, readjust your position and vent any excess air that throws off your positioning. This requires some practice in confined water and is easiest with proper weighting. Learn how to connect and disconnect your inflator. to risk a rapid ascent. If this occurs and you cannot disconnect your inflator hose, fully open the exhaust valve, get your buddy to close the corresponding tank valve or do it yourself, or in the very worst case release air through your neck seal. This is a last resort option, because venting air through the neckseal will simultaneously flood your drysuit. Practice reaching, pressing and turning your exhaust valve. This valve is usually located at your shoulder and should be in reach for both of your hands. At least one hand should be able to press it, and the other hand should be able to reach across your chest and turn it. Turning the valve clockwise closes it; the further you close it, the more air your suit can hold and the more pressure you can build up in your suit. Turning the valve counter-clockwise opens it and reduces the pressure needed for the valve to open and release air from the suit on its own. A fully closed valve can only vent air if manually purged.